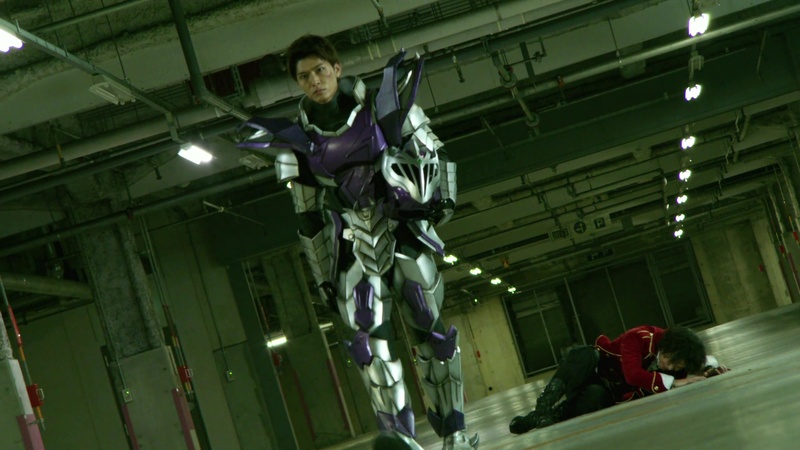 Marvelous is shocked to see Takaharu under the helmet. Takasorg shoots at Marvelous, forcing him to demorph. He puts his helmet back on and walks away. Meanwhile, Doggie Kruger runs into Stinger and they compare notes. Turns out both are here undercover. SPD had detected a mysterious and artificially created magnetic field around Planet Nemesis. Commander Stinger says they’ve also detected it in another galaxy. 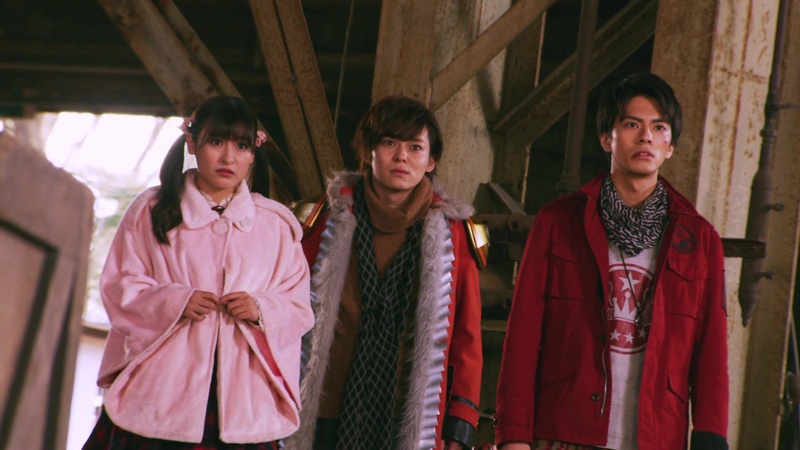 Yamato and Kagura are wondering where Takaharu and Marvelous could be now. They think about what Marvelous’ treasure could be. But Rita pops in to announce the start of the semi-finals. And up first is the B Block semis between the Martial Arts Team represented by RyuuRanger and TimeRed and the Monstrous Strength Team represented by GaoBlack and GingaBlue. Stinger brings Doggie Kruger to the contraption he found earlier and Doggie sees a magic circle around it. Stinger realizes this must be what is preventing them from making off-world contact. 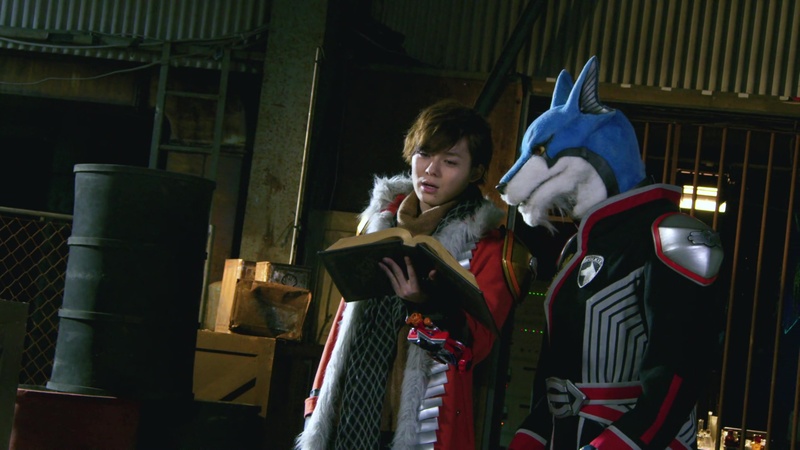 He shows Doggie Kruger the book he found, but it’s all written in ancient glyphs from another planet. Doggie Kruger scans the writing to get it translated. Just then, foot soldiers from many different Sentai seasons appear and attack them. Stinger tells Doggie Kruger to go find Yamato-tachi to tell them about they’ve found while he stays to take care of this. Takasorg walks along in the underbelly of the facility with a very Luka-like looking woman is chained up nearby. Back at the semis, the Martial Arts Team has grabbed the stone and they tell their opponents to leave Gaisorg to them. GaoBlack and GingaBlue are sent away. But suddenly, RyuuRanger and TimeRed are also suddenly zapped away by Rita. Rita is happy to see everything has gone according to plan and tells her staff that she is excited to see everyone’s reaction to the wish being granted. Stinger finishes off the foot soldiers when Gaisorg suddenly appears. They battle. Doggie Kruger finds Marvelous and helps him get up. 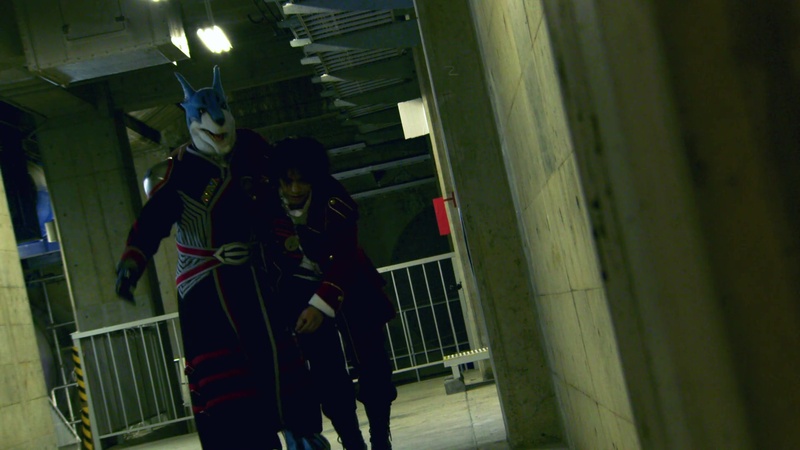 They remember the first time they met during Gokaiger. 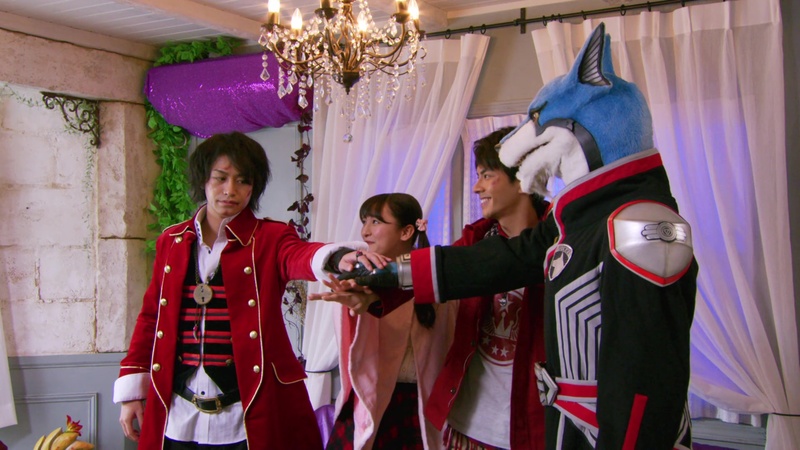 Doggie Kruger gets Marvelous back to the Oddball room and they tell Yamato and Kagura about Takaharu. 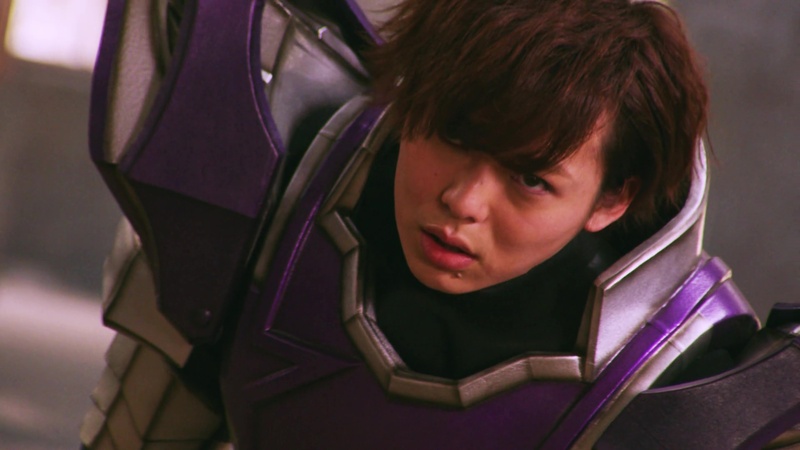 Yamato says they shouldn’t jump to conclusions about Takaharu. Marvelous says he’s noticed Gaisorg has seemed like a different person every time he’s faced him. 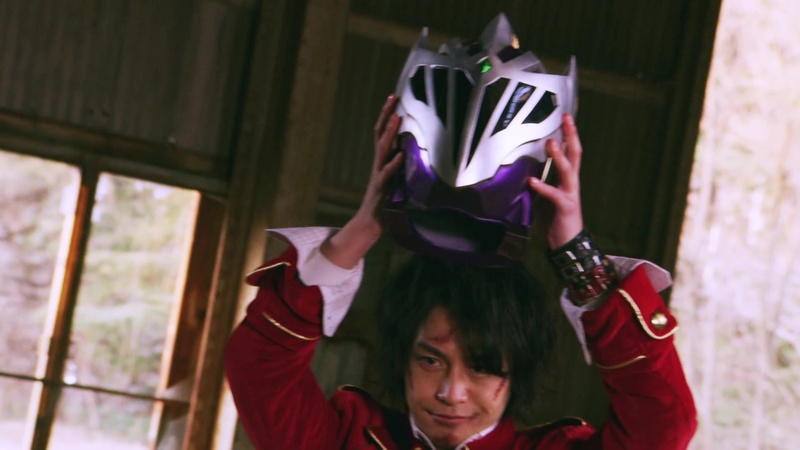 Yamato suggests someone is putting the armor on different people and controlling them. Kagura worries about the person who was last being used in Gaisorg. Doggie Kruger is sure someone is trying to use the wishing power of Planet Nemesis for evil purposes. He tells them about what he and Stinger found. Doggie Kruger says they must take care of Gaisorg. 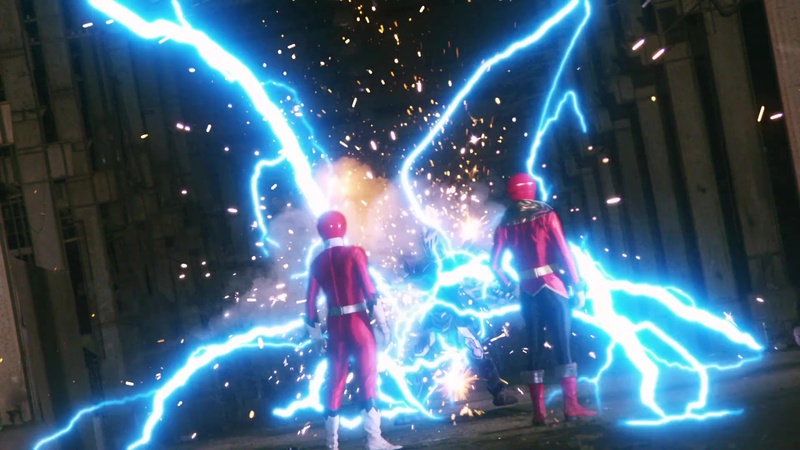 Yamato adds that they will be able to save Takaharu as well. They all put their hands in, even Marvelous. Rita pops in again to announce the start of the last semi-final. And this time, it’s Kagura vs Doggie Kruger! But this is a perfect situation for them. Doggie Kruger and Kagura head to the battlefield. They morph. Watching from their waiting room, Yamato and Marvelous talk about all of this. Will the winners end up disappointed when they have to make their wishes? Marvelous says it doesn’t look good, but he promises to be right there with Yamato unleashing his anger when that happens. 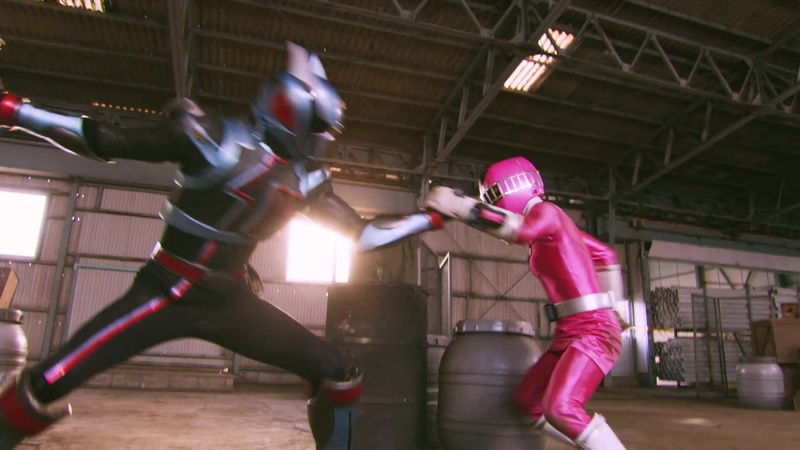 Doggie Kruger and Kagura continue to battle as she remembers the plan. He will lose to her on purpose. And an overpowering performance like that will certainly attract Gaisorg. Kagura says she should lose then, but Doggie Kruger says she can’t. He is only here on undercover work, but Kagura has her own wish that she wants granted. Doggie says he can’t let her throw away her dream so Kagura should give him all she’s got. He certainly won’t go easy on her, regardless. Those words rev Kagura up and she now has the power to really take it to Doggie Kruger. He says he is surprised at how strong she actually is and asks for what wish is she pulling this strength out from. Kagura explains it’s for her family. She wants to create a menu at her family’s restaurant that will allow people with no families a chance to find a new family. And her wish is to have the time and the means to do that. As long as she has the means, she’ll figure out the rest. Even for families that are separated, she wants food that they can all enjoy together. Kagura is able to push Doggie Kruger away and use her imagination power to believe she is the STRONGEST GIRL. 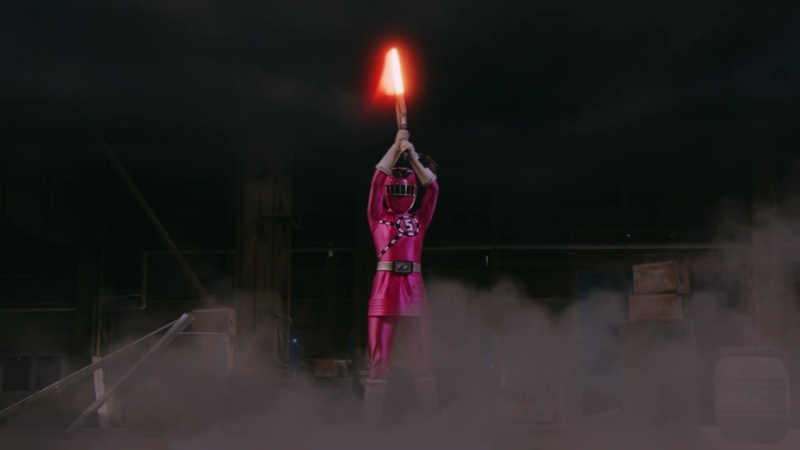 Her Lightning Blade Bamboo Splitter attack is able to send Doggie Kruger back and force him to demorph. Kagura demorphs and hurries over to check on Doggie-san. He tells her she absolutely handed his a—over to him. Doggie Kruger hands Kagura cuffs and his License and tells her to give them to Stinger to help figure out what is happening. He will leave the rest to them. Kagura understands and she turns to grab the stone. Rita declares Kagura the winner of this battle and the Oddballs advance to the finals. Doggie Kruger is transported away. Kagura promises to do her best in the finals. With the finals set, Rita’s demeanor suddenly seems to change from bright and cute to something much darker. She pulls her necklace off and tosses it. She looks up and decides they must have enough gathered. Kagura turns to head back to their waiting room. But Gaisorg finally appears. Kagura quickly morphs as Gaisorg attacks, wanting her to show him her power. He sends her flying and she is forced to demorph. Yamato and Marvelous arrive. Marvelous tells Takaharu not to take this personally as he and Yamato take him on. Marvelous uses several Gokai Changes and Yamato goes Whale and they give all they’ve got against Gaisorg as well. Rita looks up at the collection orb and expresses how she’d be so happy for justice to disappear from the galaxy. Stinger explains what’s happened to Kagura, Yamato and Marvelous. The Gaisorg suit is a sentient armor. It goes around looking for the strongest and then possesses them, one after the other. Stinger says while possessed, he saw some of Gaisorg’s memories including seeing Takaharu and a yellow pirate. It was Luka’s invitation that Gaisorg used to get here. Marvelous asks if Luka is safe and where she is. Stinger doesn’t know. 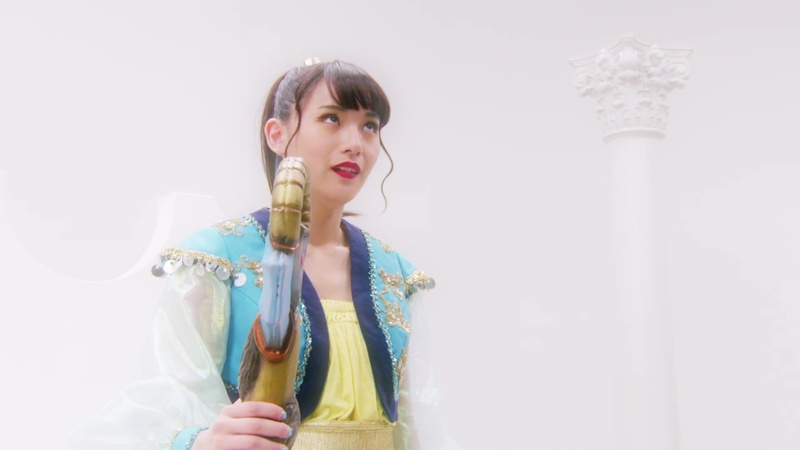 Kagura gives Stinger the License and cuffs from Doggie Kruger. Stinger reads the deciphered glyphs and it explains a spell to summon Ultimate Dai Satan, a demon who can destroy the galaxy instantly. Rita must want to revive him. Marvelous says they should go. But Yamato says they should get his treasure back first, that is, Marvelous’ friends. But how? Marvelous walks over and grabs the Gaisorg helmet. He tells them he’ll catch up. And warns they better still be alive when he arrives. Marvelous puts on the helmet and Gaisorg takes over his body. Well, they finally gone and did it. Super Sentai Saikyo Battle made me cry. 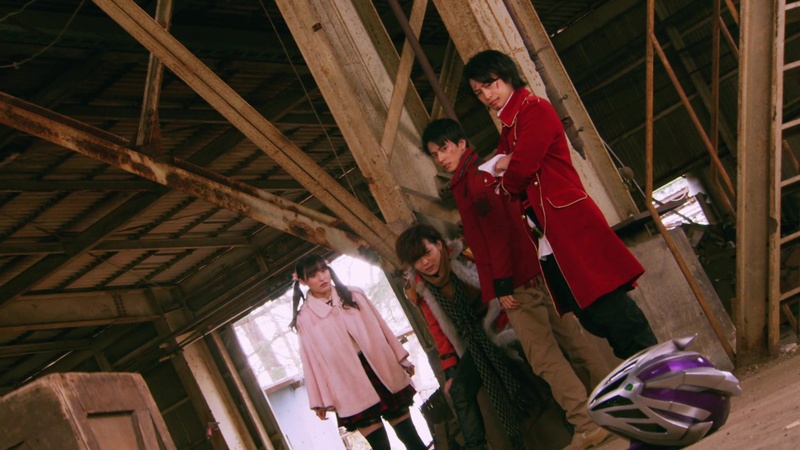 If you’ve followed my Sentai ramblings over the years, you will know ToQger is tied as my favorite Sentai season of all time. (Maybe even #1 outright some days and even including Power Rangers. hehe) So of course hearing the ToQger theme song playing during the episode was already going to get me emotional and nostalgic. But what made it even more amazing was just how they handled giving Kagura the spotlight. I was looking forward to Kagura finally getting a chance to battle in the tournament. But when the big twist arrived and seeing that she’d have to go against Doggie Kruger, I already feared they were going to go through this “Doggie lets Kagura beat him” route. That it would eventually end up showing Kagura is weak or just a kid or a “girl” and wouldn’t have ever won in a “real” battle anyway. But I was thankfully proven wrong. 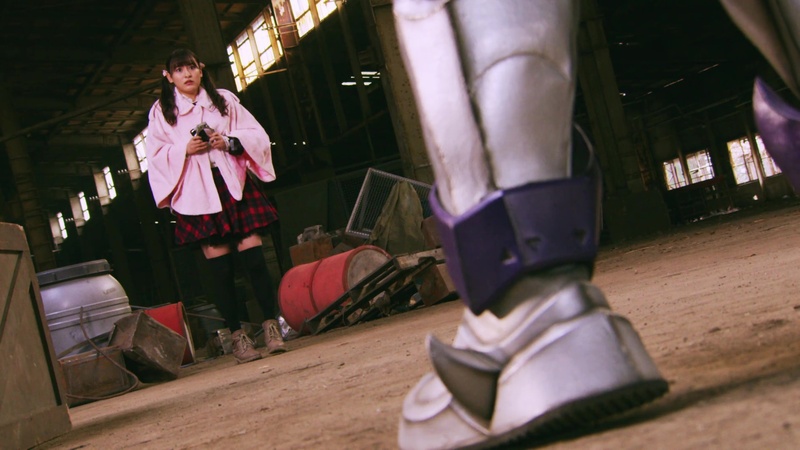 Instead, the show really made a point to show Kagura could absolutely go toe-to-toe with Doggie Kruger. He didn’t need to let up or just lay down and let Kagura defeat him with minimal effort. They actually went at it. And he commented that he too was surprised that she was so strong. He may admit that he underestimated her, but he acknowledged that he shouldn’t have in the first place. Especially knowing what Kagura was fighting for and how powerful that goal can truly be. Kagura is obviously more than sincere in her wish. 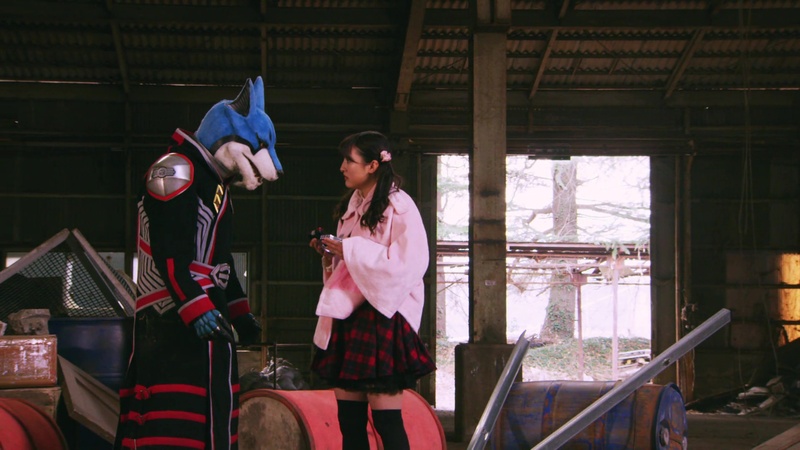 And as she was explaining to Doggie-san why she wanted it, anyone who watched ToQger would know that that is very much in line with her character and one of the major themes of the season as a whole. And of course we know of Kagura’s imagination power, especially when she imagines and materializes that she is strong. So she absolutely fits perfectly with this Strongest Battle tournament. All of this combined just got me bawling. MaGMCM? Absolutely! And I loved it. This was really an amazing episode. Certainly the best so far as all the pieces have fallen into place. The Gaisorg twist makes perfect sense. Controlling the bodies of those it deems most powerful. Who or what Gaisorg is and where it came from should be one of the big reveals in the finale. Meanwhile, we see Rita switch from being the kawaii host we’ve seen so far to the real, more sinister Rita with an evil plan. Nana Asakawa has really done a great job. Like, from the beginning, you know she wasn’t just some peppy host. But still, her bright personality lulled you into a sense of security. And her sudden 180 turn this episode really had a lot of impact. And that’s very much thanks to her performance as well. Should be exciting to see her full-on Big Bad in the next episode. This has really been such a great miniseries so far and it really has enough material to go on for even one or two more months really. These first three episodes have been packed with stuff and many ideas. But we just have one episode left. Overall, a really amazing episode that I absolutely loved. Yes! This was really a Great eps. And now I am even more excited for the Finale. Although, why was Doggie shirtless. LOL! And I was totally right about Rita being evilm and the Gaisorg armor possessing people. Generally, "Toqger" is my very first and favorite series. I watched "Power Rangers" since I was little, but I decided watch some "Super Sentai" out of curiosity, because USA used Japanese fragments with fights. And that's why I started to watch another series. As Right used to say: "I can see it! ", the final can be really amazing! Such a great episode for Kagura!